"Do not forget the Lord, your God." These are the words spoken by Moses to the Hebrew people in the Book of Deuteronomy today, on the Solemnity of Corpus Christ. "Do not forget the Lord, your God." It seems as though it should be entirely impossible to forget God. I mean how do you forget GOD? Forget an appointment? Sure. Forget a classmate from high school? Of course. Forget to set your alarm? Okay. But forget the Maker of all things visible and invisible, the Source of Being, the Alpha and the Omega, the Lord and Giver of Life? This seems impossible. But there it is from the lips of Moses: "Do not forget the Lord, your God." Moses instructs the people to remember all that the Lord had done for them. Remember that he led them, freed them, healed them, quenched their thirst, and fed them." Truth to be told, we do forget God. Don't we? Think about those Hebrew people. They had a lot on their minds. They were wandering in the desert, preparing battles, engaged in judicial procedures, entering into marriages, raising children, working, dealing with illnesses, mourning losses, burying loved ones, and a thousand other day to day realities that we call, "life." They were busy. They weren't necessarily busy with bad things. They were just busy. Today, we celebrate the beautiful feast of Corpus Christi. 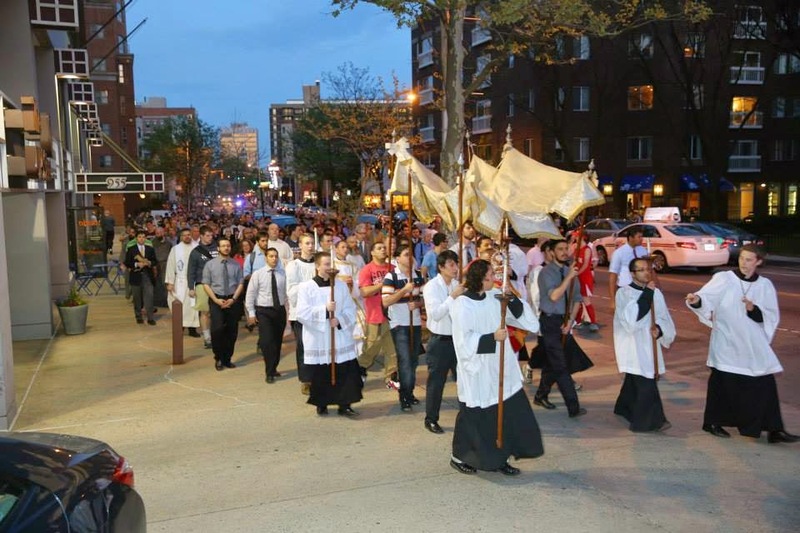 As part of today's feast, many Catholic communities have a procession. The image of the Corpus Christi procession for me is a beautiful reminder of who we are as Catholics. We are all people on the move. We are all people who are living our daily lives, engaged in all sorts of activities, fulling our responsibilities, and doing the work entrusted to us. Sometimes, however, we can feel as though our lives are disconnected. Not just disconnected from one another, but disconnected in our own persons. Our life can seem to have no consistency. There's my work life, my family life, my church life, my interior life, my exterior life, my temptations, my relationships with this particular group, my relationships with that particular group, my hobbies etc. We are the ones doing these things, but somehow, they can seem to have no consistency, no unity. But, on Corpus Christi we discover the source of unity--the Eucharist. We fall in line--together--behind the Eucharist. Because, as St. Paul says, "Because the loaf of bread is one, we, though many, are one body, for we all partake of the one loaf." The Eucharist gives consistency to our life. In that procession, we are reminded that everything in our life finds unity in Christ. In that procession, we are reminded that our life is not just running from one thing to the next thing. No, we are processing to God. We are being led to eternal life. Everything in this life is part of a great procession to life eternal. Our life has meaning and purpose. We can forget God. Even those of us who work in the Church can forget God. We can become so busy with our projects and plans, that we forget that we are in the procession. Sometimes this forgetfulness is willful. Whether it be because of anger, sorrow, or shame, we can refuse to remember God. When we feel those inspirations to pray, we can shut them down. But, this forgetfulness can also be more gradual. We can simply be caught up in all of the individual pieces of our lives and lose sight of what is most important. But to live in this way, is entirely unsatisfying and exhausting. It drains us. And so, we have Corpus Christi. Today we remember that we are a people who are fed by God Himself. And we are fed not merely with bread, but with God Himself. The more we grow in our Faith in the Eucharist and in our Love for the Eucharist, the more our life has consistency; the more unified our life becomes. We are a people who--in our joys and sorrows, fears and hopes, triumphs and failures, virtues and vices, merits and sins, wounds and strengths--are fed by the Lord. He is with us in all of these things. He never leaves us. He alone gives meaning to our life. Whether we are joyful or sorrowful, we are in the Lord. We are in the procession. When we forget God, our life can feel a bit like we are in a mob of people frantically running in different directions, hopelessly trying to make sense of things. But on Corpus Christi, we calmly find ourselves together in the procession. The procession provides a confident hope within us. In the procession we discover that our life--in all of its complicated and varied aspects--possesses a unity. This unity is discovered and lived in Christ. He provides this unity and he perfects this unity. The procession is making its way through history and is on its way to eternity. This Eucharistic Procession takes our whole life and orders it towards its proper end. Unlike our ancestors who ate and still died, whoever eats this bead will live forever. When we forget God, our life becomes disconnected, disorienting, and chaotic. In remembering God, we remember that we are being loved, fed, and led. And this remembrance gives our life unity and meaning. Do not forget the Lord, your God. In the Book of Judges we read how the Lord commanded Gideon to shrink the number of his troops before waging battle. The Lord warned that if Gideon were to march into battle with too many troops, the Israelites might think that the victory was attained through their own achievement. Instead, just 300 Israelite soldiers waged a successful battle against the Medianites. The glory belonged entirely to God. When I began this blog, I did so in order to share a little bit about what it is like to be a priest and to do my part in advancing the New Evangelization. 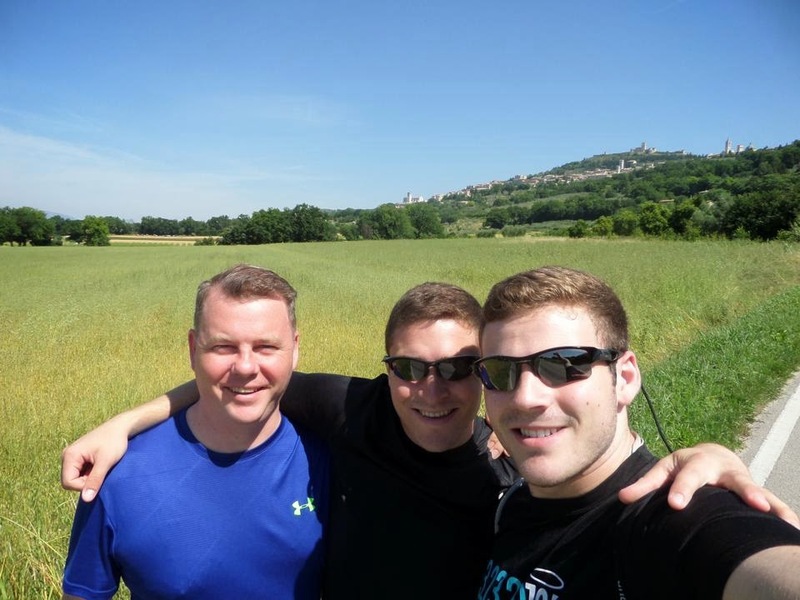 I am just back from spending a beautiful two weeks traveling around Italy with a couple of people whom I met through my assignment at Boston University and who kindly invited me along. Like other times that I've travelled with parish families on vacation, the beauty of this trip, the experience of prayer and of friendship, and the joy of living discipleship together clarified something to me about the New Evangelization. The New Evangelization belongs to Christ. It is by his power that the Gospel advances. My job--the job of every disciple--is to witness to the power of Christ in their life. In recent months, I've grown increasingly concerned about an approach to evangelization that seems to rely almost completely on a corporate/business model. It's vocabulary (and thus, its methods) is dominated by terms like, "market share, statistics, value statements, mission statements, flow charts, policies, and procedures." There has been an almost wholesale catapulting of traditional ecclesial, evangelical, and theological terminology in favor of a corporate/business model. Sometimes, it has the feel of theological language being attached to the corporate language as an afterthought. In comparison to this model, I would point out the value of such books as "Forming Intentional Disciples" and the Facebook forum by the same name. On this page, one can find great statistics about religious practices, helpful discussions about various programs, and sincere attempts to understand data. But, in the final analysis, Sherry Weddell--the author--and those who participate in her forum do not fall under the delusion that the New Evangelization will be the result of understanding data and building programs and procedures based upon data. In the final analysis, as the title of the book makes clear, the New Evangelization is about "Forming Intentional Disciples." It is about following Christ. So, what does any of this have to do with Gideon, the Medianites, this blog, and my trip to Italy? I think one of the significant problems with the corporation model of evangelization (that is detached from any theological anchor) is that it gives the impression--perhaps unintentionally--that victory will be the result of our planning and strategizing. This model can sometimes skip over discipleship and rely simply upon professionalism. We are training people to "do things," but we are not forming them first (and consistently) as disciples of Christ. When I was kneeling next to my travel mates at the tomb of St. Francis, I thought to myself, "This is so awesome. What a great gift it is to be here and to pray together." St. Francis changed the world by being a faithful disciple. The Church was rebuilt by a radical following of Christ. It was rebuilt by the witness of his life and those of his company. I have little doubt that the corporation model of evangelization is unsustainable. Detached from any substantive theological foundation, it will suffocate under its own weight. But for those who want to propose an alternative form of evangelization, we must be cautious that we do not make the same fatal mistake of relying upon our own cleverness and the persuasiveness of our our argumentation. That would be equally as disastrous. That would be to think that success is dependent simply upon ourselves. Sometimes, in my zeal to propose an alternative to the corporation model, I find myself resorting to self-reliance rather than to relying upon a simple witness to Christ. We must continually propose the beauty of Christ and witness to the work of Christ in our life and in the life of our communion together. Christ is attractive. Following Christ is to be happy. Living in the communion of the Church is beautiful. The witness of a holy life draws others. The joy of the Gospel is not something manufactured but something that is received. Sometimes, when I write about evangelization, I do so in the hopes of moving the ball--even slightly--in a different direction. But, Gideon, St. Francis, and Italy reminded me of something. The best way to move the ball is simply to be moved by Christ and to witness to this movement in my own life. What moves me in my life is witnessing how Christ lives and works in the lives of those whom I encounter. This is what convinces me of Christ and makes me desire to follow him more. What convinces me of Christ is not my own successes, my own virtues, or the success of my own pastoral strategies. What convinces me of Christ is the tenderness and mercy of his gaze on my life. It is a tenderness and mercy that comes to me through the friendship of the companions whom Christ places in my life and through the Sacraments. If this is what convinces me, then I ought to trust that this is what Christ will use to move others. I just spent two weeks in Italy eating great food, drinking good wine, visiting and praying at various shrines and holy places, and experiencing the loving gaze of Christ on me through the friendship and companionship of those who travelled with me. It was a beautiful experience of what it means to live the Catholic life. Gideon had his 300 soldiers and that was enough. Francis had a few brothers and that was enough. I had some pasta, gelato, wine, and some shrines all lived in the companionship and friendship of other disciples. That's my witness. And, I trust, it's enough. The first time I visited the rectory where I now live, I arrived to find the pastor siting out on the back porch having his lunch. It is an open-air porch that is covered. I thought, "I think I will like this." Now that the long, miserable, cold, dreary winter is over (I don't really like winter), the porch furniture has returned and the porch is once again occupied by those of us who live here. In the evening time especially, I am regaled with stories of Ireland, South America, the old days in Boston, seminary life in the 1950's and 1960's, the characters that made up the Boston presbyterate, and commentary on all things present. I'm the youngest in our house, except for the occasional seminarian, but I've never been at a loss for telling my own share of stories or offering an opinion. Amid the smell of pipe tobacco (not mine) and the sound of laughter, I am reminded of how beautiful it is "for brothers to live in unity." When I was a pastor, one of the things I most enjoyed was living in a large rectory with a large yard. It was not because I needed all of that space. I enjoyed it because it meant that there was lots of room in that house for others. There were times--especially when the seminary was on vacation--that we would struggle to find room for everyone. When parishioners would stop by the rectory, it would provide them great joy to find seven or eight priests and seminarians sitting in the kitchen laughing away. It is good for brothers to live in unity. Last night, I was invited to a dinner of priests at a friend's rectory. The evening--from beginning to end--was very beautiful. It is good for brothers to live in unity. Since the time of the apostles, there has always been a temptation towards envy, careerism, and factions among priests. That's because priests possess this thing called, "human nature," and that human nature is wounded by original sin. There are things within the clerical culture that nurture disunity. One such thing is a communication style marked by obfuscation. Instead of having direct and clear conversations about important matters, clerics sometimes speak in euphemisms and with an indirectness that would impress the most seasoned diplomat. While this type of language might be what is needed in the diplomatic world in order to avoid wars and misunderstandings, among brothers, there ought to be a greater directness and freedom. I think that one of the things that is most unsettling about Pope Francis is that one never knows what he's going to say next. I grant that sometimes some of his marks have needed numerous clarifications and sometimes have had unintended consequences. But all the same, I like his directness. Pope Francis doesn't talk about transparency. He is transparent. Ask Francis a tough question, he mightn't answer it exactly the way he wished he had, but you don't leave the conversation scratching your head and wondering, "What was the answer?" It's refreshing. While many people have made a big deal about Pope Francis not living in the Apostolic Palace, that really doesn't mean all that much to me. Some say that he didn't live there because it was too opulent. From what I hear, his predecessors who lived there lived quite simply. The reason the Pope has given for not living in the Apostolic Palace is simply that he wants to be around other people. That makes sense to me. He doesn't want to live so far away from others that he becomes protected from reality. I suspect that Pope Francis wanted to make certain that he wasn't insulated from reality by a culture that sometimes thrives on intrigue and obfuscation. Directness doesn't equal rude! We all know rude people. Sometimes they justify their rudeness by saying, "I'm direct." No, they're rude. One can be direct without rudeness and one can be rude through silence and obfuscation. One important way of building up the local Church is through strengthening the fraternity of priests. Sometimes, we presume that theological differences are the root cause of disunity among priests. But, I think it is something more fundamental than that. A lot of times, what is lacking is simply a humanity. This is why Pope Francis is living among people. He doesn't want his humanity mummified through a lack of human contact. The more priests and bishops live together and eat together, the more we will grow in our humanity. The more priests and bishops live closely with their people, the more we encounter directness. This is good for us. Without it, we tend to become ideologues or functionaries. When we speak about the New Evangelization, it is tempting to think that the answers are all found in grand sweeping projects and programs. But, one of the critical parts of the first evangelization was the formation of the clergy. Jesus spent a lot of time with his apostles, eating and drinking with them, walking with them, talking with them, fishing with them, praying with them, and sharing a common life together. The first evangelization began with what was human. I think the New Evangelization also needs this human touch. Today, I am struck by two ways that Pope Francis is putting his mark on the New Evangelization: Closeness to people and directness in language. There is something profoundly human about those things. And a New Evangelization requires a profound humanity. The reform of the clergy certainly requires us priests to spend more time in front of the Blessed Sacrament and more time (as penitents) in the confessional. But, it probably also needs us to spend more time on the porch and in the dining room speaking brother to brother.